This 3-ingredient, easy, garlicky shortcut vegan aioli recipe comes together in just 5-minutes! It’s the perfect sandwich spread and dip for your favourite finger foods. This is NOT your classic aioli recipe! If classic is what you’re looking for, this recipe is not it. Classic aioli is an emulsion made with olive oil, a few other ingredients, and a mortar and pestle. There are also aioli recipes from other countries that call for egg yolks. What makes this recipe different? This recipe is dairy-free, egg-free, and olive oil-free and it’s made with prepared vegan mayonnaise, so it’s definitely not a classic aioli. 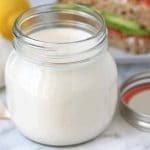 You can find from-scratch vegan aioli recipes that walk you through making your own vegan mayo emulsion and then building the up flavours, but again, that isn’t what this recipe is. 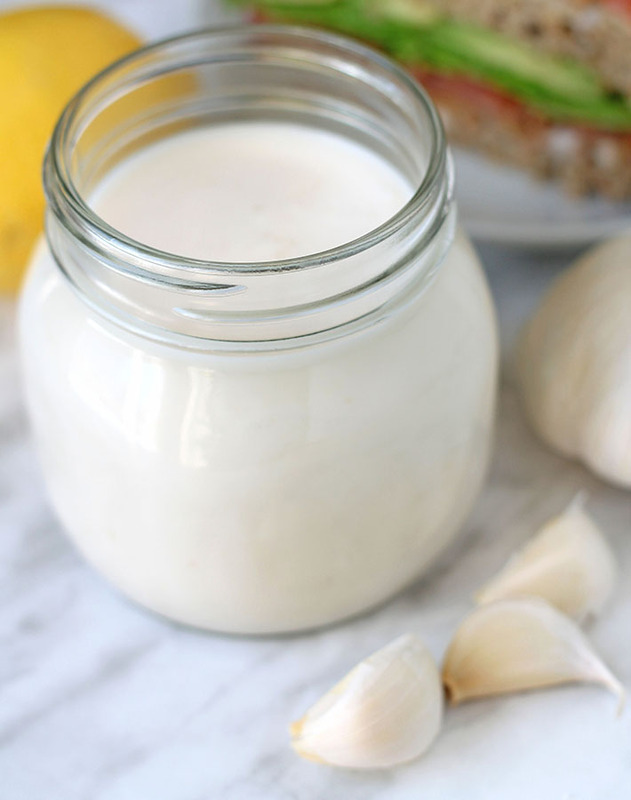 If what you’re looking for is a quick, easy, shortcut vegan garlic aioli (or vegan aioli mayonnaise), then you’re in the right place! What Makes this a Shortcut Recipe? The base of this recipe is store bought mayonnaise, so there’s no need to whip up vegan mayo from scratch. There are also minimal ingredients in this vegan aioli sauce….just three! Mayo, fresh garlic, and fresh lemon juice. How Do You Make Vegan Garlic Mayo? You’ll start out with your mayo, which serves as the base of the recipe. What is the Best Vegan Mayo? There are many brands you can buy, my personal favourite is Hellman’s Vegan but if you can’t find that one, other popular choices are Vegenaise and Just. 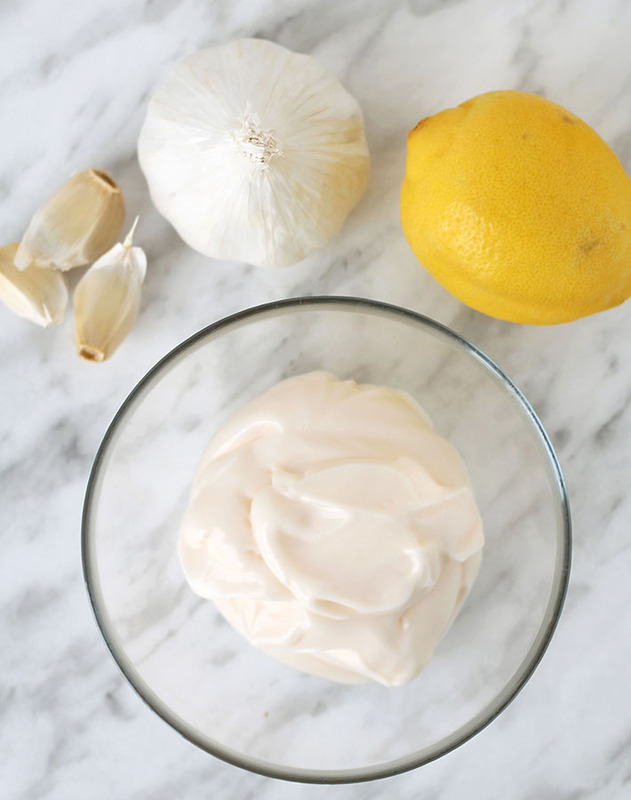 No matter which one you use, the important thing is that you use a vegan mayonnaise that you love since it will be the base of your vegan mayo aioli. To press your garlic, you’re going to need a good garlic press like this one. 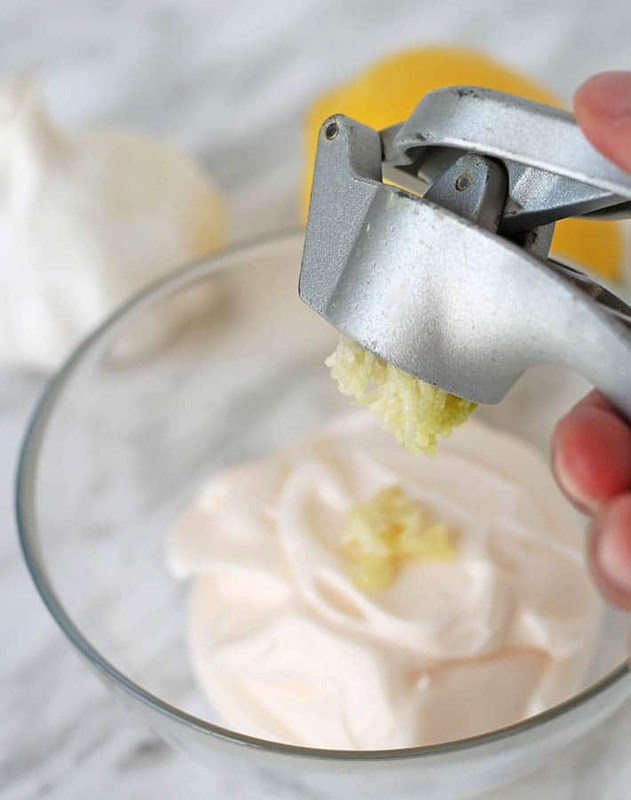 If you don’t already have a garlic press, I highly recommend you get one because they’re great to have in the kitchen and it will make preparing this recipe so much easier! If you don’t have one, you can still make this garlic sauce, you’ll just need to take some time to mince the garlic very fine so there are no big pieces. Next, you’ll add the lemon juice. It’s important that you use freshly squeezed lemon juice and not the lemon “juice” that you can buy in the little plastic lemons. 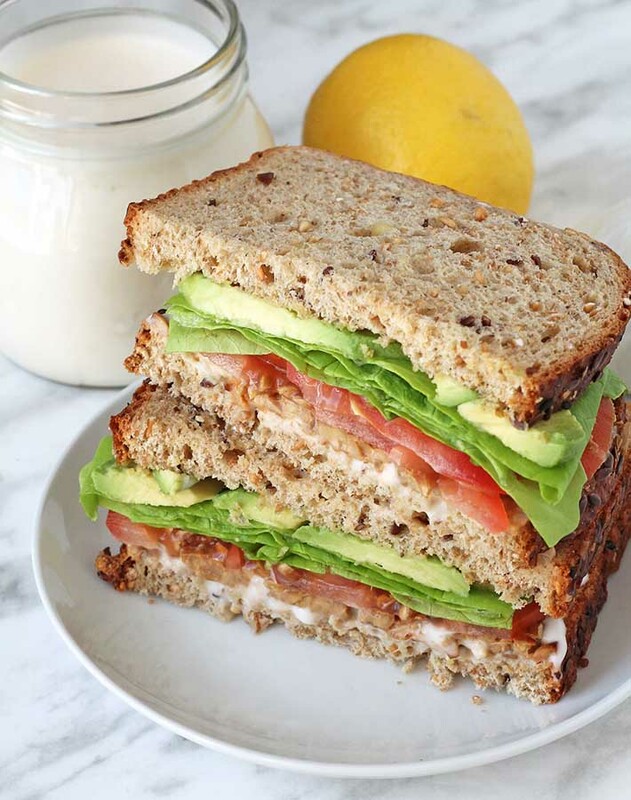 Fresh is always best and the lemon flavour helps to give the vegan aioli a slight, mouthwatering tartness that mixes so well with the other flavours. You’ll then mix everything together until all the ingredients have combined. After mixing, you can taste it to see if it needs salt. Whether it needs salt or not will be dependent on the mayo brand you use. I find that the Hellman’s already has the right amount of salt, so I don’t add any but if the brand you use doesn’t contain much, then feel free to add some, to taste. When you taste the aioli at this point, it will taste good, but it will not be the final flavour. The next step is to transfer it to an airtight jar and refrigerate for at least an hour. That hour will give the ingredients a chance to mix, mingle and fully develop into the best shortcut vegan aioli. My favourite way is in sandwiches, and my favourite sandwich to have it in is a TTLA sandwich. 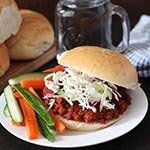 If you haven’t heard of or had this sandwich before, you need to try it! “TTLA” stands for tempeh, tomato, lettuce, and avocado. And it’s SO good. Especially with a big slather of vegan aioli mayonnaise. YUM. If you make this, tell me about it in the comments below! I’d love to hear what you serve it with! 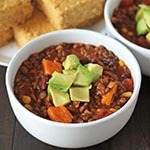 You can also pin this recipe to Pinterest. 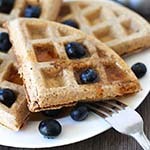 And for more easy vegan recipes, be sure to sign up for my newsletter. 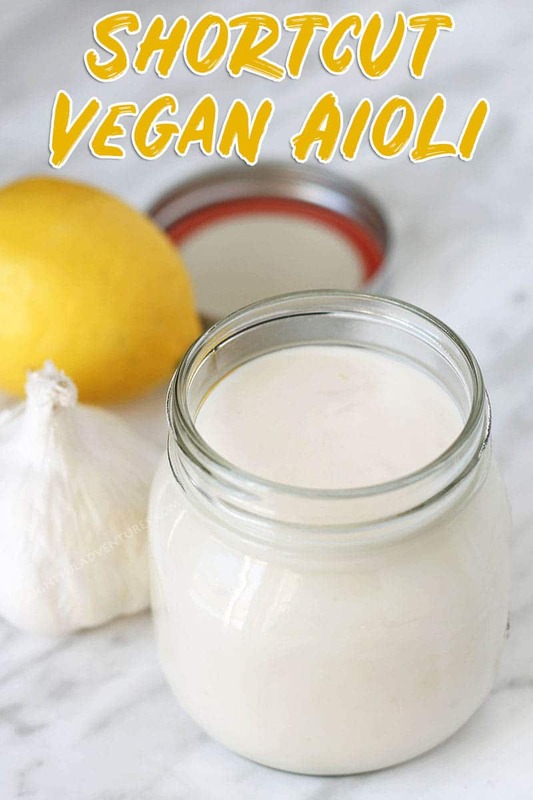 This easy, garlicky shortcut vegan aioli recipe comes together in just 5-minutes and needs just 3-ingredients! It's the perfect spread for sandwiches and dip for all of your favourite finger foods. 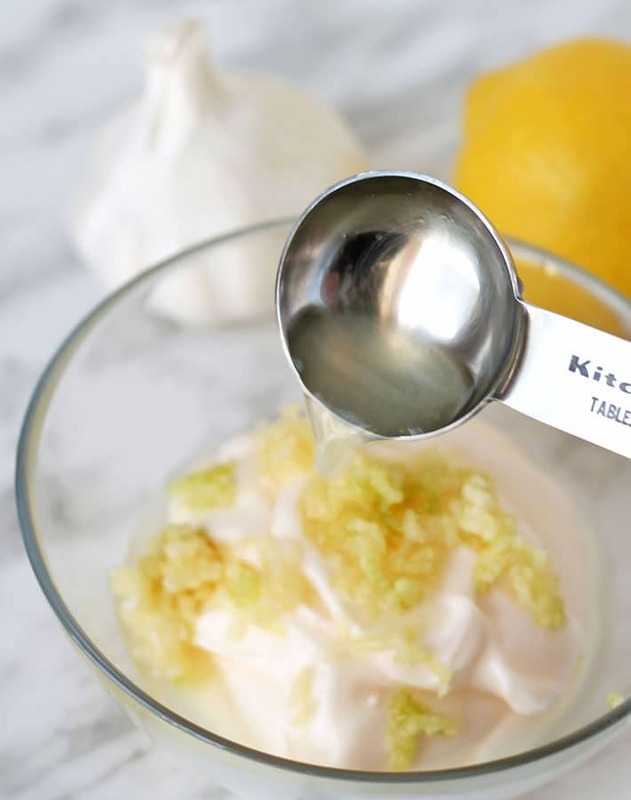 Add all ingredients to a bowl and whisk together until combined. Taste, and add optional salt, if needed. Cover and refrigerate for at least 1-hour for flavours to combine. Adapted from Epicurious' Easy Aioli. For best results, use fresh garlic and fresh lemon juice for this recipe. Start out with 2 cloves of garlic and taste. If you like your aioli extra garlicky, add an extra pressed garlic clove. Recipe can be doubled or tripled, if needed. 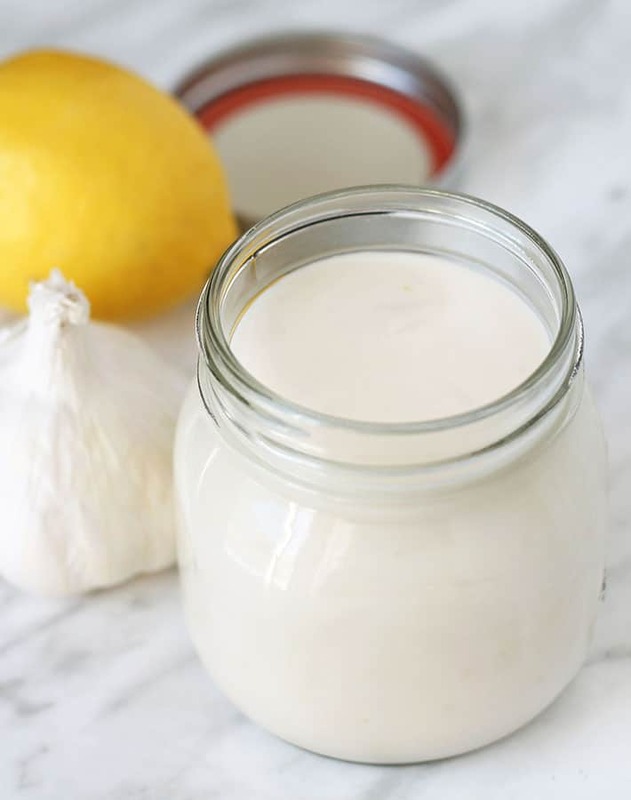 Store leftover aioli in the refrigerator for up to 7 days.. Nutrition info is based on 2 tablespoons of vegan aioli, made with the recipe as it is written, and no optional salt added. Data is only to be used as a rough guide, click to learn how nutrition info is calculated on this website.